William E. Lewis Jr. & Associates, a solutions based professional consulting firm specializing in the discriminating individual, business or governmental entity, is proud to announce the formation of a credit repair component. Facing uncertain economic times, Bill Lewis – formerly with Credit Restoration Consultants – has been widely sought by many in the restoration of their personal credit worthiness. Approximately 78% of credit profiles in the United States contain some sort of error or omission materially affecting credit worthiness. Absent self-help and the “do-it-yourself” approach, a consumer may hire a credit repair company in the restoration of their good name and reputation within the community. In tough economic times, your good name and reputation is more important than ever. Creditors have tightened their guidelines effectively barring millions of Americans from borrowing money. Even those with excellent credit are experiencing reduced credit limits and closed equity lines. Mortgage lenders, auto finance companies, credit card issuers and banks have all raised the bar. The terms credit repair, credit restoration or credit rehabilitation are somewhat synonymous. Those with bad credit histories cannot afford to ignore the potential benefits of credit repair. In today’s economy, a strong FICO score is more important than ever. Long gone are the days of obtaining credit, goods, benefits, services and/or employment with a 620 score. In most instances, a consumer will be denied if they maintain a credit score lower than 740. Even those with high credit scores have experienced closed credit card accounts and equity lines. When an account has not been closed, credit limits have been reduced to the current balance due. Borrowers with low credit scores can expect to be denied or to pay significantly higher interest rates than those with excellent credit. Operating within William E. Lewis Jr. & Associates is a small credit service organization specializing in the restoration of consumer credit worthiness as well as identity theft. We assist consumers in achieving a favorable financial credit profile. Everything we do at William E. Lewis Jr & Associates is legal utilizing laws enacted by Congress to dispute negative, erroneous, obsolete, and/or fraudulent information contained within your consumer credit profile. Utilizing the Fair Credit Reporting Act, the Fair Debt Collection Practices Act, the Fair Credit Billing Act, and the Fair and Accurate Credit Transactions Act, William E. Lewis Jr & Associates will assist consumers in the submission of disputes electronically, verbally and in writing to the Equifax, Experian and Trans Union consumer reporting agencies in addition to creditors, collection agencies, third-party record providers and state/federal/private regulatory authorities. Unlike most credit repair clinics that submit the same written dispute letters monthly, William E. Lewis Jr & Associates has devised a credit restoration strategy utilizing the Fair Credit Reporting Act, the Fair Debt Collection Practices Act, the Fair Credit Billing Act, the Fair and Accurate Credit Transactions Act, in addition to laws applicable to a consumers state of residence. Keep in mind that anything William E. Lewis Jr & Associates can do – you can do yourself. That means that you do not have to hire William E. Lewis Jr & Associates – or any other credit repair company – to review, investigate and/or dispute alleged discrepancies on your credit report. Where William E. Lewis Jr & Associates may have an edge over the average consumer is that we possess the education, knowledge and a source proven method that consistently yields results. William E. Lewis Jr & Associates has obtained thousands of deletions and updates for its clients and can help remove erroneous and/or inaccurate judgments, liens, bankruptcies, student loans, inquiries, derogatory tradelines, personal identifiers, arrests, etc. While the credit restoration process can take anywhere from 30 days to six months, most clients see dramatic results in 45-60 days. Credit repair, credit restoration and/or credit rehabilitation is as legal as pleading “not guilty” in a court of law. With that said, one must understand that as a credit service organization William E. Lewis Jr & Associates is not a law firm and that none of their employees is an attorney licensed to practice law in the state of Florida. As such, William E. Lewis Jr & Associates cannot provide legal advice nor represent any individual before any court or in any legal proceeding. In the event that legal representation is required, William E. Lewis Jr & Associates may provide an appropriate attorney referral for consultation. Under the Fair Credit Reporting Act, as modified by the Fair and Accurate Credit Transactions Act, consumers are entitled to a free copy of their credit report under a narrow set of circumstances. If you have been denied credit, goods, benefits, services, insurance, and/or employment, the credit reporting agencies of Equifax, Experian and Trans Union are statutorily mandated to provide a copy free of charge. Equifax can be contacted at (800) 685-1111 or www.Equifax.com; Experian can be contacted at (888) 397-3742 or www.Experian.com; and Trans Union can be contacted at (800) 916-8800 or www.TransUnion.com. Be sure to prompt that you were denied credit when requested to do so. 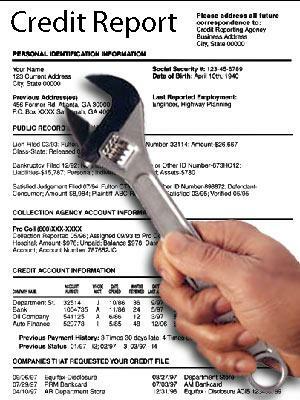 Absent these exceptions, consumers are entitled to one free “annual credit report” per year. Credit scores are not included with any of the “free credit reports” provided by the national credit reporting agencies. When self-help or the “do-it-yourself” approach is not feasible and you decide to hire a company to restore your credit, be sure to check them out. While the majority of credit repair clinics are scams, a few good ones do exist. Consumers can check out a credit service organization through their state Attorney General, the Federal Trade Commission at www.ftc.gov or through the Better Business Bureau at www.BBB.org. For more information, please contact William E. Lewis Jr & Associates at (954) 337-1530 or visit them on the Internet at www.williamlewis.us. The Credit Report with Bill Lewis airs live, Monday through Friday from 7am-8am Eastern Time with an encore presentation Saturday’s at 4pm on AM 740 WSBR. Streaming audio is available at http://www.wsbrradio.com and on air participation is welcome at (888) 721-0074. If you miss the early broadcast, The Credit Report with Bill Lewis is still available weeknights at 9pm Eastern Time, Saturday’s at 6pm and Sunday’s at 8pm on AM 1470 WWNN by streaming audio at http://www.wwnnradio.com. For daily updates on The Credit Report with Bill Lewis, you can join Bill’s 35,550 plus fans on Facebook at: http://www.facebook.com/thecreditreportwithbilllewis. While the economy has been showing some signs of improvement, your good name and reputation is becoming more important within the community. Creditors have tightened their guidelines effectively barring millions of Americans from borrowing money. Mortgage lenders, auto finance companies, credit card issuers and banks have all raised the bar. Borrowers with low FICO scores can expect to be denied or to pay significantly higher interest rates than those with excellent histories. The terms credit repair, credit restoration or credit rehabilitation are somewhat synonymous. Those with bad histories cannot afford to ignore the potential benefits of credit repair. In today’s economy, a strong FICO score is more important than ever. Approximately 78% of credit profiles in the United States contain some sort of error or omission materially impacting credit worthiness. Absent self-help and the “do-it-yourself” approach, a consumer may hire a credit service organization (CSO) in the restoration of their good name and reputation within the community. Most – but not all – CSO’s specialize in the restoration of consumer credit worthiness as well as identity theft issues. Assuming that the credit repair company is performing within the law, they utilize laws enacted by Congress to dispute negative, erroneous, obsolete, and/or fraudulent information contained within your consumer credit profile. Utilizing the Fair Credit Reporting Act, the Fair Debt Collection Practices Act, the Fair Credit Billing Act, and the Fair and Accurate Credit Transactions Act, a reputable CSO will assist in the submission of disputes electronically, verbally and in writing to the Equifax, Experian and Trans Union consumer reporting agencies. Disputes are also submitted to creditors, collection agencies, third-party record providers and/or state, federal, local, and private regulatory authorities. Unlike most credit repair clinics that submit the same written dispute letters monthly, a reputable CSO will have devised a strategy whereby disputes are submitted electronically, verbally and in writing over a long period of time to the credit reporting agencies, creditors, collectors, and third-party record providers reporting negative, inaccurate, obsolete and/or erroneous information. Keep in mind that anything a CSO can do – you can do yourself for little to no cost. With that said, a reputable organization should have an edge as they will possess the education, knowledge and a source proven method that is generally unknown to the average consumer. A reputable CSO should have a provable track record of results as well as the ability to modify and/or remove erroneous or inaccurate judgments, liens, foreclosures, bankruptcies, short-sales, student loans, inquiries, derogatory tradelines, personal identifiers and other transient data from a consumer’s credit report. Although the credit restoration process can take anywhere from 30 days to six months, most individuals should see some results within the first 45 to 60 days. Credit repair, credit restoration and/or credit rehabilitation is as legal as pleading “not guilty” in a court of law. With that said, one must understand that most CSO’s are not law firms and that their employees may not be licensed to practice law. As such, even a reputable CSO cannot provide legal advice nor may they represent a consumer before any court or in any legal proceeding. In the event that legal representation is required, the credit repair company should provide an appropriate attorney referral for consultation. When self-help or the “do-it-yourself” approach is not feasible and you decide to hire a CSO to restore your credit, be sure to check them out. While the majority of credit repair clinics are scams, a few good ones do exist. Consumers can check out a credit service organization through their state Attorney General, the Federal Trade Commission at www.ftc.gov or through the Better Business Bureau at www.BBB.org.